Exposure: L = 480 min. R&G = 230 min. each B = 200 min. Ha = 480 min. Click on the image below to view at higher resolution. NGC 4038 and 4039 are a pair of colliding galaxies in the constellation Corvus approximately 45 million light-years distant. The galaxy pair are known as the Antennae Galaxies due to the long streamers, or tidal tails, that have been expelled into the surrounding intergalactic space. To some, these features resemble the antennae of a gigantic celestial insect. About 1.2 billion years ago these two were normal spiral galaxies that were approaching each other. NGC 4039 (the upper galaxy) was the larger of the two and is thought to have been a classic spiral while NGC 4038 was probably a somewhat smaller barred spiral. About 900 million years ago the two began to interact gravitationally and it is thought the two actually passed through each other about 600 million years ago. Although the galaxies collided and passed through each other, it is interesting to note that, in all probability, no stars actually collided. The distances between the stars are just too vast for collisions to occur. This, however, is not true for the giant clouds of gas and dust within the galaxies. They did collide violently and billions of new stars were created in a starburst of activity. 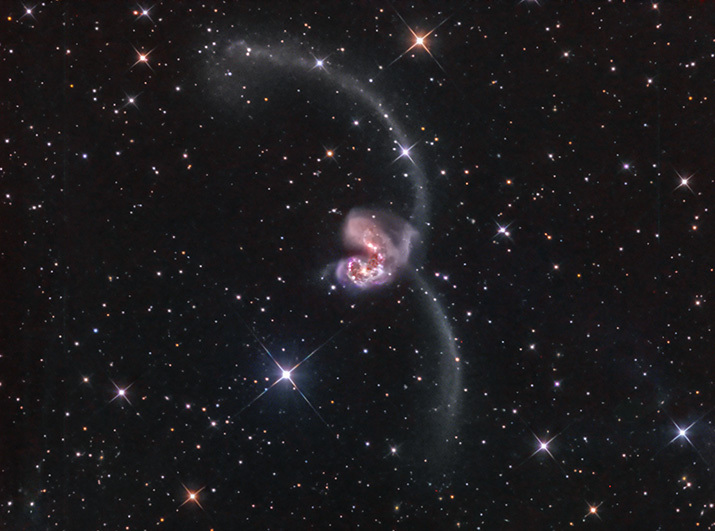 The gravitational interaction of the colliding galaxies not only disrupted, and destroyed, the spiral structure of galaxies but also expelled stars, gas, and dust that eventually formed the two antennae streamers. The merging dance of the pair will continue for many millions of years with the eventual outcome being a huge elliptical galaxy. Much like what is happing to the two Antennae Galaxies will be the predicted fate of our own Milky Way and our neighboring Andromeda galaxy. The Milky Way, like NGC 4038, is the smaller barred spiral and Andromeda is the larger spiral galaxy. Our two galaxies are currently approaching on a collision course and in a few billion years another galactic "train wreck" is in store!